Fall is here, and so is fall yard maintenance time. Fall is here, and so is fall yard maintenance time. Unless every tree in your yard is an evergreen, now is about the time that you start thinking about raking up all of the leaves that are out there. It’s a big job, but somebody has to do it! Follow these easy tips to get your raking done and keep your yard looking great all season long! These fall days can get quite blustery. All of that wind can either be really inconvenient for raking or it can help you. 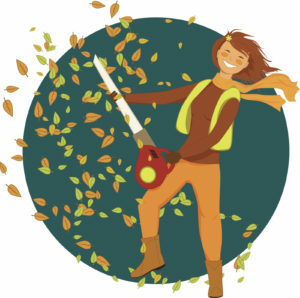 If it is a windy day and you’ve got some time to get some yard work done, pay attention to the wind. Which way is it blowing? Instead of frustrating yourself by trying to move against the wind, figure out which way it is blowing and rake in the same direction. This way, the gusts of wind will just move with you and you won’t be going over the same area multiple times. No matter how difficult it is for you to watch all of those leaves just pile up in your yard, there’s really no point in raking before they have all fallen. If you don’t wait, you will be spending quite a bit of your weekends raking instead of doing other things. Just think of all of the other projects you could tackle in that time! Well, this is kind of cheating, but if you have a mower that will chop the leaves and pull them into bags this will make your raking go much faster. You can find mulching mowers in either gas or electric varieties. This entry was posted on Friday, November 17th, 2017 at 3:34 pm. Both comments and pings are currently closed.